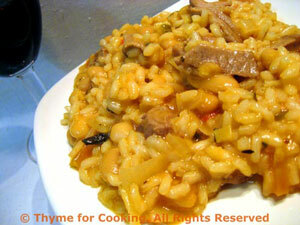 Risotto with Lamb, White Beans, Breton Style, Thyme for Cooking easy dinner. Risotto is the perfect way to use up leftovers! I usually plan for them. If you don't have lamb left you can substitute a cooked, (poach in stock) boneless, skinless chicken breast - or just skip the meat. With all the lovely beans and vegetables, it's a satisfying dinner without it! Add the Parmesan and the condimenti, stir well, spoon into a bowl or risotto platter and serve immediately. It will continue to absorb liquid and the leftovers (if any) will be quite stiff. While risotto is cooking, put all ingredients in a small skillet or saucepan. Gently heat through, cover and keep warm until needed for risotto. Note: The risottos that we have eaten in northern Italy have all been served in soup plates (flattish bowls) and eaten with a spoon - not a fork.